Very good news for all the candidates! 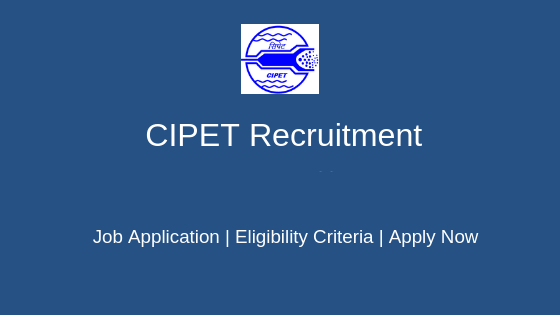 CIPET (Central Institute of Plastics Engineering & Technology Recruitment 2019 has taken out the official Notification, it has released a total of 24 official posts for CIPET Senior Technical Officer Recruitment 2019 and CIPET Scientist Recruitment 2019. The application link is now active. Candidates who have been dreaming to apply to this role and want a shift in their career into technical jobs should apply for it as soon as possible. CIPET is looking for very motivated and enthusiastic candidates to join them. Those candidates who are eligible and looking for career growth and an excellent opportunity to nurture their soft skills can apply. Total Vacancies: Tentatively 24 in total. Candidates who are willing to apply for CIPET Recruitment 2019, should have possessed a degree in Ph.D./ ME or M. Tech/ CA / ICWA / SAS from a recognized institution or university. 3. If Central Institute of Plastics Engineering & Technology receives a large pool of applications, then only those candidates who have been shortlisted on the basis of qualification, experience in the relevant fields shall be considered for the post.